A perfect recipe for the classic British dessert. 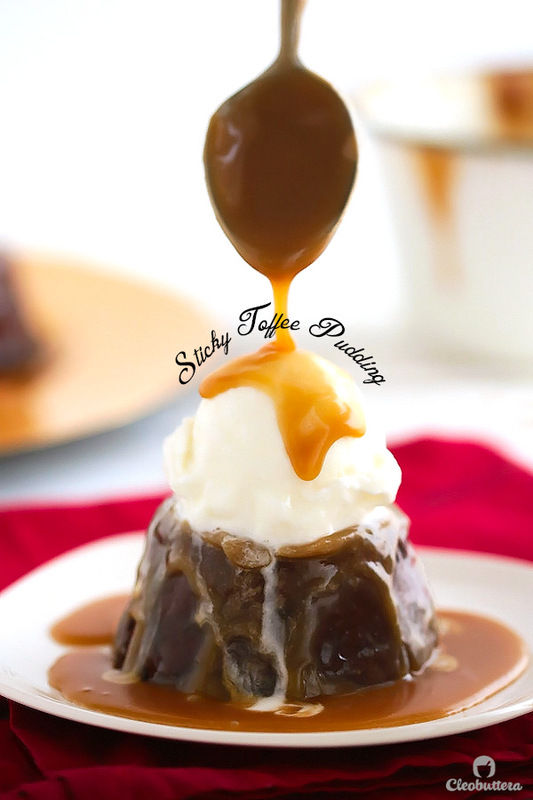 Warm date laced cake, soaked and drizzled with a luscious toffee sauce. Served with a scoop of vanilla ice cream, this indulgent dessert will make your tastebuds sing. Plus recipe VIDEO included! This right here…is one of my favorite desserts in the history of EVER! As in if I could choose my last meal, this would be IT. Sorry chocolate desserts, you’re still high up there. But this…was love at first bite. Sticky toffee pudding and I met about 4 years ago in my kitchen. I had been itching to try the popular British dessert for so long and found no better timing to make it than during a cheat meal I had while on a nightmare-like diet. Could be due to food deprivation, but my first bite was like nothing I’ve ever experienced before. It was like the peak of a romantic movie. Eyes closing, music playing in my head and an imaginary camera swiftly filming around me in circles. It was like it swept me off of my feet. I knew I had to sit down for the this one…and pour more toffee sauce. Every bite after that, was followed by an “Mmmmmm” and a stare at it in disbelief. I just couldn’t believe that something could taste THIS good. This warm, moist and flavorful cake doused with toffee sauce and hugged by vanilla ice cream, transported me to cloud number 9. Honestly, I didn’t think I was even gonna like it at all. 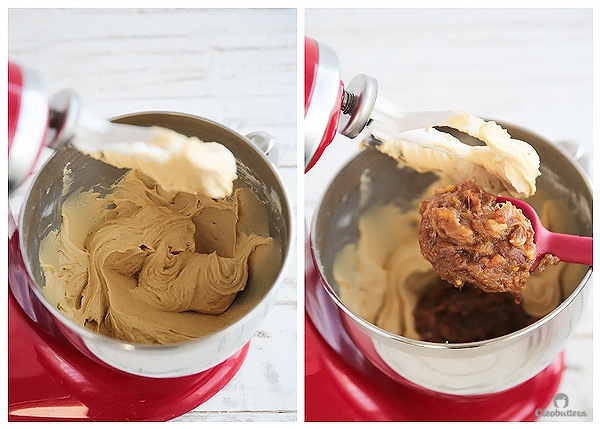 The fact that it has dates in the batter is just plain…weird? I mean, I do love dates, but I think of them more as an energy source, instead of food for pleasure. Boy was I wrong…So dang wrong! 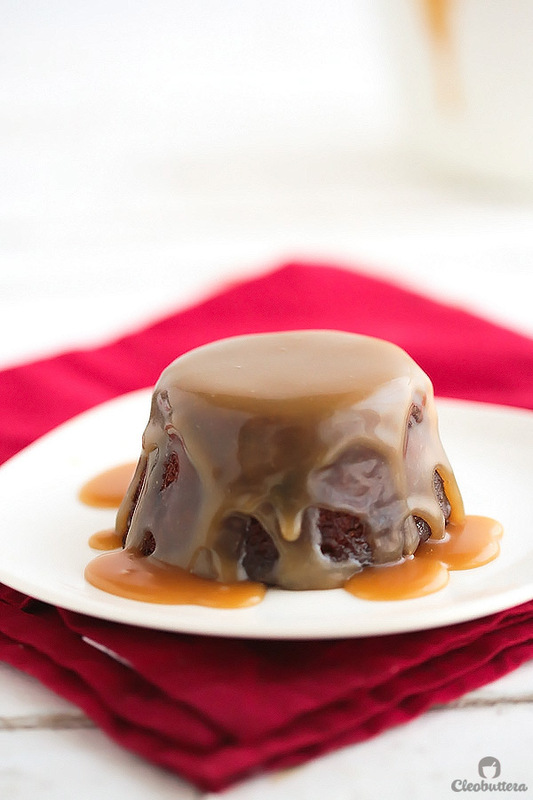 Sticky toffee pudding, unlike its name, is actually very cakey, and not at all pudding-y. Apparently the word ‘pudding’ is used in Britian for the word ‘dessert.’ I think…Don’t quote me on that! But after coming up with a phenomenal dessert like that, the British can call it ‘Rakabooba’ if they want and we won’t complain. This recipe is a perfect representation of the delicious dessert. 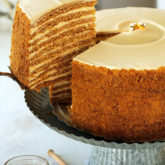 The cake is moist (without being soggy or dense), flavorful and simply delicious. The sauce is drinkable! Put them together and you’ve got yourself the perfect marriage of flavors. Now let’s make it! Now that you’ve watched the video and probably drooled, let’s talk details. Find yourself some soft and plush dates like medjool (or magdool) and get rid of their pits, and chop ’em up. Put them in a saucepan with water and cook until they soften up and become mushy and the water is absorbed, about 5 minutes. Then stir a teaspoon of baking soda. It will foam up and make you feel like a cool chemist. The baking soda is there to help soften the date skins. Leave that to cool while you go make an easy peasy yummy toffee sauce. 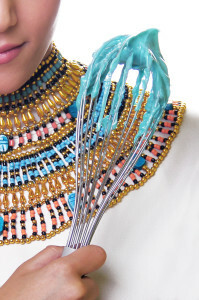 Then you’ll make a cake batter like most cake batters, mixing together butter, sugar, eggs, vanilla, flour and baking powder. Then you add in the cooled date mixture. 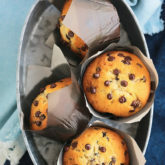 Make sure its well mixed then portion into jumbo cupcake pans and bake. 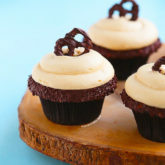 *I chose to make it into jumbo cupcakes this time around, but below in the ‘Recipe’ section, you’ll find instructions for both regular-sized cupcakes and a 9inch cake. I actually make it into the 9inch cake most of the time. So it’s your call. 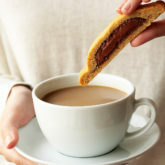 As soon as they come out of the oven, poke a ton of holes and pour some of that delicious hot toffee sauce right on top. Give it about 5 minutes for the sauce to soak in. Then turn into your serving platter and drizzle with more sauce. Oh yeah! Cute and all but for me, served with a scoop of vanilla ice cream is the only way to go! And when it comes to that toffee sauce, the more the merrier. I have a feeling you will fall in love too. A perfect recipe for the classic British dessert. 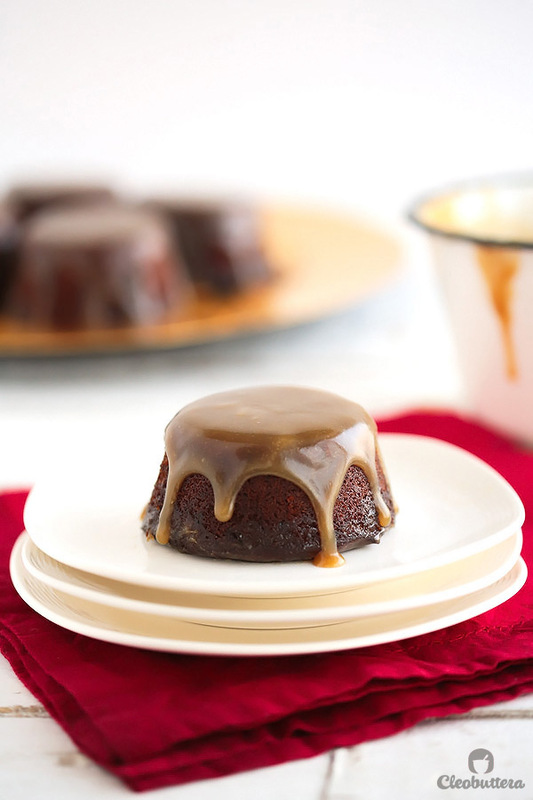 Warm date laced cake, soaked and drizzled with a luscious toffee sauce. 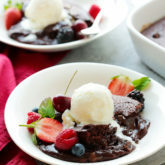 Served with a scoop of vanilla ice cream, this indulgent dessert will make your tastebuds sing. In a medium saucepan, put the dates and water together and cook over medium heat. Simmer together, stirring constantly until the dates are soft and mushy, and the water is absorbed, about 5 minutes. Remove from heat and stir in the baking soda. The mixture will foam. Transfer to a large plate, cover and set aside to cool completely, slightly warm is ok. Or put in the freezer to speed things up. Then adjust the oven rack to lower middle position and preheat the oven to 350F/180C. 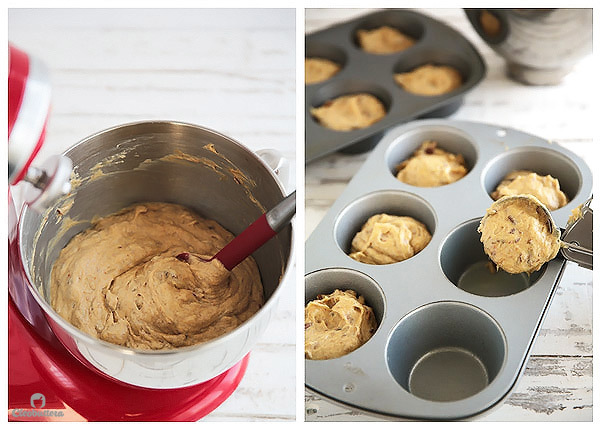 If making jumbo or regular cupcakes, grease and flour or non-stick spray the cupcake pans. If making one large cake, then grease or spray the bottom of a 9inch pan, line with parchment paper or foil round, then grease and flour or spray over the rounds and on the sides of the pan. In the bowl of a stand mixer fitted with the paddle attachment, or a regular large bowl and a handmixer, beat the butter with both sugars until lightened in both texture and color, about 5 minutes, scarping down the bowl as needed. On lowest speed, gradually add the flour mixture, just until combined. Do not overmix. Add the dates and mix gently on low speed just until well combined. Scrape down the bottom and sides of the bowl, to make sure that everything is well mixed together. Fill the regular-sized cupcake pans with 1 scoop of batter in each cavity or 2 scoops for regular-sized cupcakes, filling them 2/3 of the way. For the large 9inch pan, pour all of the batter in the prepared pan. Bake for (17 to 20 minutes for regular-sized cupcakes), (22 to 25 minutes for jumbo cupcakes) or (50 to 60 minutes for the large cake). 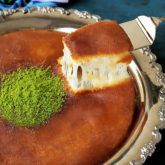 Because different ovens vary in temperature, the best way to test for doneness is to make sure that a toothpick inserted in the center of the cake comes out with a few cooked crumbs attached, the sides starts to pull away from the pan and the center springs back to the touch. Take out of the oven then reheat the toffee sauce until very hot. 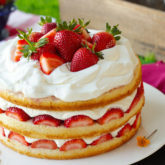 Poke holes all over the cake using a tooth pick or wooden skewer, then pour (1 tablespoon of sauce on top of each regular sized cupcake), or (2 tablespoons for each jumbo cupcake), or (1/3 of the sauce over the large cake). Leave the sauce to soak in for about 5 minutes, then turn the cake(s) on to a serving platter. 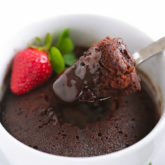 Pour (1 more tablespoon of sauce on top of each regular sized cupcake), or (2 tablespoons for each jumbo cupcake), or (1/3 of the sauce over the large cake). The remaining sauce is for serving on the side. 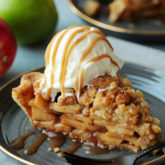 Serve warm, topped with a scoop of vanilla ice cream (optional) and more toffee sauce if desired. Store leftovers in an a airtight container, then heat individual servings in the microwave until warm. Remove from the heat and use according to the recipe. Weight of the dates may vary from one type of dates to another. Although 1 1/2 cups of medjool dates always comes out 10oz/ 284g with me, I've found that other kinds of dates tend to be heavier or lighter. Although I'm a huge proponent of the scale, this is probably the only time I'll recommend measuring anything by volume (cups) to get a more accurate measurement. To measure the dates, remove the seeds, and pack it in the cup. If you only have a scale, then go with the suggested weight of 10oz/284g; and try to stick to medjool. 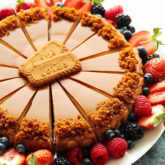 Make sure that the brown sugar used here is the soft kind that feels like wet sand and packs and sticks to itself, like Domino's brand and Red Path. This was the first recipe I ever tried for STP and fell in love immediately. I thought it might be just beginner’s luck, so I tried several other recipes, you know…just to make sure that it really is THE ONE. I’m tellin’ ya, this one reigned supreme. I think that you’ll fall head over heels over this one. Deeeelish! Green? Whoaaa! I didn’t see that one coming. What type of dates did you use? Are sure your baking soda is not expired? 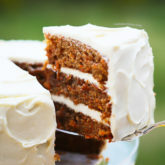 What is the best way to store the leftover cakes (fridge or freezer)? 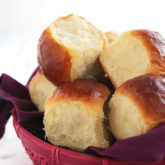 I want to try this recipe but I know I will only be able to eat one or two at a time. How long will they last for? These will keep well, stored in an airtight container in the refrigerator for about 3-4 days, heating individual servings as needed. If you don’t need that much cake hanging around, then first I’d suggest you make only half of the recipe. I do that all the time with great results. 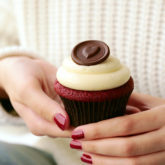 Half the recipe will yield 12 regular cupcakes, or 6 jumbo cupcakes, or a 7 or 8inch cake. Pour the toffee sauce ONLY on the piece you’re gonna be eating, and leave the rest bare for storage. Wrap individual servings in plastic wrap then place in a freezer zipper lock bag and store in the freezer for up to a month. We ready to serving, let in thaw, then pour the toffee sauce on it and heat it through in the microwave. How ru Tasbeeh,it was my pleasure to meet u today at HAYAH school cooking class.im not a beginner &i made toffe sauce several times but its the 1st time the brown sugar didnt dissolve at all!!? 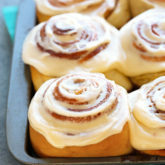 ?i know it wasnt the moist kind but still?also cant remember u dissolve sugar 1st then add butter?thanks in advance. Hi Tasha! These are dried medjool dates, but they are very plump & soft. Ok, thanks, so happy because I can’t find fresh ones here. That’s perfect then:) Enjoy the dessert; it’s one of my absolute favorites! Can this be served cooled. Meaning if I preparing it 7hrs before being serving it will it still have the same taste,and if yes how shall i store it. Yes it still tastes really good at room temperature too, however it is meant to be served warm & quite honestly I find it to be more delicious this way. I sometimes prepare the batter hours in advance, pour it in the pan, cover it with plastic wrap then store it in the fridge until I’m ready to bake. I also make the sauce early & just simply reheat it when the cake is almost finished baking. If you really really have to bake it that early. 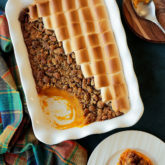 Let it come to room temperature then store it under a cake dome or airtight container, then heat individual slices in the microwave, pouring extra warm sauce on top. It will be as good as freshly baked. Hi tasbih, i was just wondering.. What type of heavy cream u use? Hi Ola I either use Juhayna (the whipping cream type) or Beity but lately I’ve been liking Juhanya more, the ones that come in 500ml packages. I’ve been having really bad luck with the liter bottles in both brands; they comes out with big clumps like cheese. I’ve found that the smaller 500ml boxes always comes nice & smooth & milky all the way through. Can i use cooking cream instead?? It’s better to stick to heavy whipping cream as cooking cream has a lower fat content & will produce a thinner sauce. It will still work though, so use it if it’s the only thing you have on hand. Oh Aliaa darling you’re most welcome:) Sticky toffee pudding is and will always be high up there is my top ranked desserts of all time. The first time I tried it was a sweet revelation. I just never saw it coming. 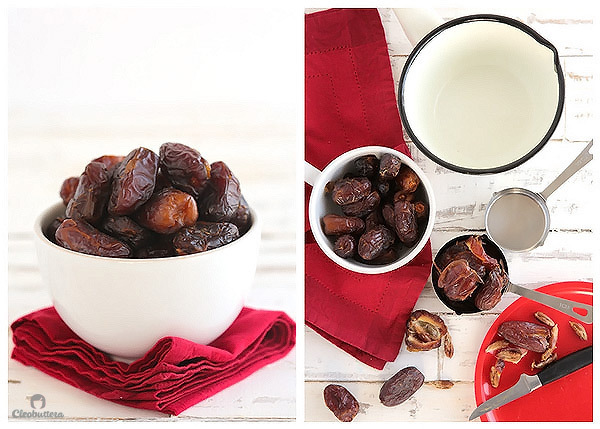 Who would’ve thought that dates could make such a mean dessert?! I’m so happy that you and your mom feel the same way about it too and loved it as much as we do. Thank you so much for your feedback! Hi Jain:) I wouldn’t really recommend using date paste here because it’s texture is very different from raw dates. 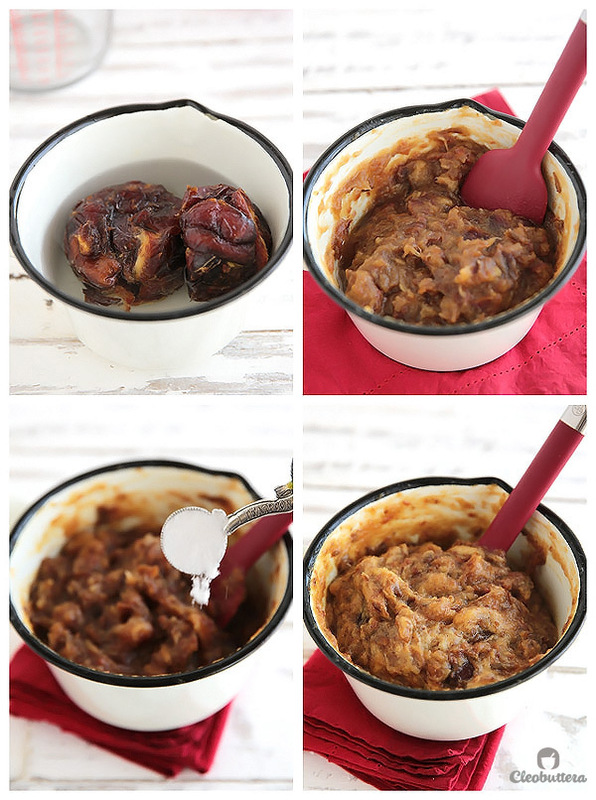 Date paste is made by cooking dates in water then pureeing it with a little more water. To be honest I’m worried that the high water content in the date paste will give you different results. If you still want to experiment with it then just use the same amount but maybe reduce the water a bit. Thank you for getting back to me so quickly. 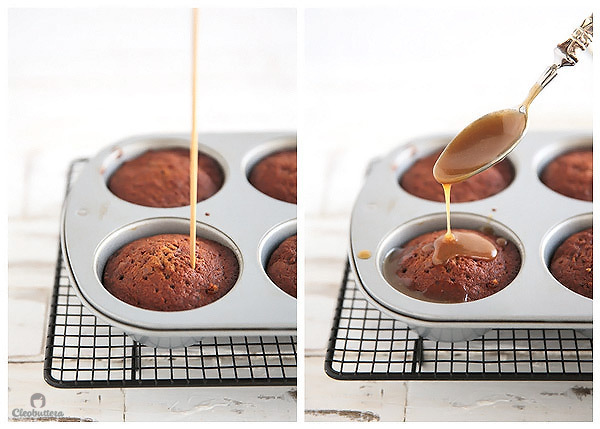 I’ll use regular dates then, because I love sticky date toffee cake! 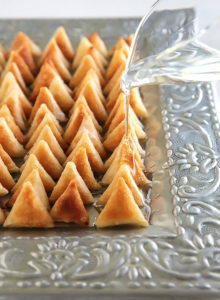 This is my go-to dessert when I have company! Thank you for this amazing recipe. I made a whole bunch extra this time around. I was wondering how long are they good for if they stay in the fridge or should I freeze them? Oh so sorry for my late reply 😬 So happy you love this cake so much! I think leftovers can keep well in the fridge for a couple of days. Hi Nuha! The temperature should remain the same. As for the baking time, it really depends on the size of your ramekins, but assuming they’re around the size of jumbo cupcakes, then they should bake in about 22-25, give or take. Check it with a toothpick at 20 minutes, then increase the time if it’s still not done. This recipe is soooooo good!!! I haven’t eaten anything as good as this.. My family n friends loved it!! When topped with ice-cream it tastes even better.. 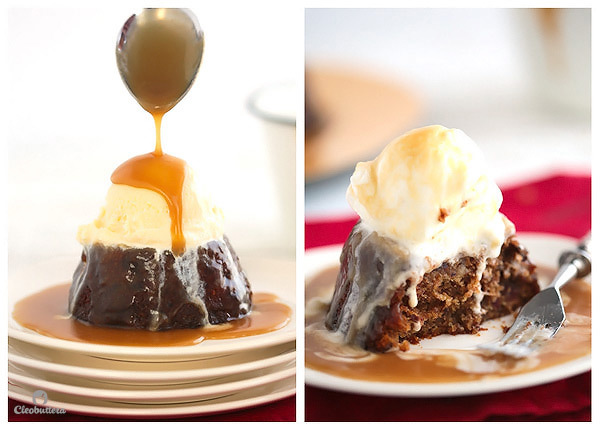 Warm cake.. Toffee sauce.. Ice cream.. Yumm! 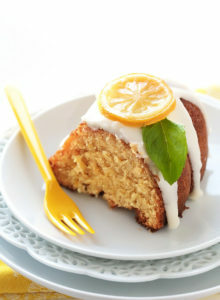 Thank you for such a wonderful recipe.. Love! 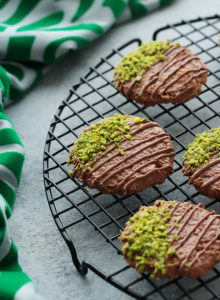 These look lovely! do these freeze well? Thank you so much Janki! I’ve honestly never tried freezing them myself, so can’t tell for certainty if they do. They’ve never lasted more than a day at my house lol! Sorry I wasn’t able to help. Thank you so much Janki! I’m honestly unsure as I haven’t tried freezing them before. They never last more than a couple of days at my house lol! I’ve refrigerated them though, and they reheat in the microwave really well.